Supporters of Iran's democratic opposition hold a rally in London, Jan. 4, 2018. FOR THE LATEST DEVELOPMENTS IN FARSI: Please follow @VOAIran and ir.voanews.com. 1/4/2018 9:42 p.m. -- Despite the Iranian government's comments that said anti-government protests were dwindling, Iranian Nobel Peace Prize laureate Shirin Ebadi said the protests were continuing, and she urged her countrymen to press on with their demonstrations in interviews published Thursday, RFE/RL reported. FILE - Shirin Ebadi participates in the World Summit of Nobel Peace Laureates, April 25, 2012, in Chicago. On Wednesday, Ebadi urged Iranians to press on with their nationwide protests. "People are still in the streets. Even if they go home, their anger would remain, and the protests would resurface months or years later," Ebadi said in an interview with Reuters. "People should stop paying electricity, water, and gas bills. They should not pay their tax. They should withdraw their money from banks," said Ebadi, a human rights lawyer who was awarded the Nobel Peace Prize in 2003. 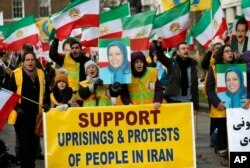 She told Reuters Iran's security forces should also ignore orders to repress the protesters. "I call on my dear children in the police forces and the Revolutionary Guards to put down their guns and do not kill their own brothers and sisters. If the country's situation improves, you would also benefit from it," said Ebadi, who lives in exile in London. 1/4/2018 5:35 p.m. -- The U.N. Security Council is planning an emergency meeting about Iran on Friday, after U.S. Ambassador Nikki Haley requested an emergency U.N. meeting Friday on the situation. But Russia and other members of the U.N Security Council are criticizing the U.S. call for a meeting, saying the protests are a domestic issue and do not involve threats to international peace and security. Alma Konurbayeva, a spokeswoman for current council president Kazakhstan, confirmed that Friday afternoon’s meeting is about Iran. Council members could insist on a vote before taking up the topic, and it would take nine of the 15 votes to go forward. 1/4/18 1:07 p.m. -- The U.S. State Department says it is still closely monitoring the "protests and violence in Iran" and has condemned "in the strongest possible terms the deaths to date and the arrests of at least one thousand Iranians." "We have ample authorities to hold accountable those who commit violence against protestors, contribute to censorship, or steal from the people of Iran. To the regime’s victims, we say: You will not be forgotten," said a statement issued Thursday. 1/4/18 - 11:45 a.m. -- Amnesty International says Iranian authorities "must ensure the right to peaceful protest, investigate reports that security forces have unlawfully used firearms against unarmed protesters and protect hundreds of detainees from torture and other ill-treatment." “Law enforcement officials have the right to defend themselves, and a duty to protect the safety of the public. However, reports of the use of firearms against unarmed protesters by security forces are deeply troubling and would contravene Iran’s human rights obligations under international law,” said Philip Luther, Amnesty International’s Research and Advocacy Director for the Middle East and North Africa. At least 21 people have been killed during the protests. The Anglo-Iranian communities, supporters of Iran's democratic opposition, the National Council of Resistance of Iran (NCRI) and main organised opposition movement PMOI, hold a rally opposite the entrance of 10 Downing Street in London, Jan. 4, 2018. 1/4/18 10:31 a.m. -- A rally was held in London, near the prime minister office at Number 10 Downing Street, in solidarity with the anti-government protests in Iran. During the gathering in London, a request was handed to the police outside Downing street, for support of both the protesters and the aspirations of the Iranian people for democratic change in Iran. 1/4/18 10:25 a.m. -- Iran's interior minister Abdolreza Rahmani Fazli said that "based on precise statistics we have'' some 42,000 people took part in protests accross the country. The anti-regime demonstrations began last Thursday in Mashhad and spread to other cities. Protests have abated over the past day. 1/4/18 7:11 a.m. -- Russia has urged the United States not to interfere in Iran's "internal affairs" as the country has been rocked by days of protests. President Donald Trump has tweeted numerous messages of support to the protesters. "We warn the U.S. against any attempt to interfere in the internal affairs of the Islamic Republic of Iran," deputy foreign minister Sergei Ryabkov told the Tass news agency. 1/4/18 5:55 a.m. — The Iranian government has taken a lesson from the Arab Spring in responding to the worst anti-government protests the country has seen in nearly a decade. Heavy-handed tactics by Arab governments against popular uprisings in 2011 led to the overthrow of regimes in Egypt and Libya and sparked a civil war in Syria. Iran had its own Arab Spring-inspired demonstrations in 2011, but police deployed in relatively small numbers and refrained from using deadly force, leading the protests to die down. ​1/4/18 3:30 a.m. — In Los Angeles, Iranian Americans are closely watching the protests in Iran. Many in the Iranian community of Southern California, the largest outside Iran, are hoping for a peaceful resolution, and reform. Shirin Ebadi participates in the World Summit of Nobel Peace Laureates, April 25, 2012, in Chicago. 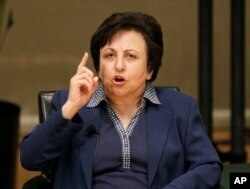 On Wednesday, Ebadi urged Iranians to press on with their nationwide protests. ​1/4/18 2 a.m. — Iranian Nobel Peace laureate Shirin Ebadi has urged the people of Iran to engage in civil disobedience and press on with nationwide protests. The pan-Arab daily Asharq Al-Awsat in Dubai, United Arab Emirates, quoted Iran’s most famous human rights lawyer as saying Iranians should stay on the street and that the constitution gives them the right to protest. Ebadi called on Iranians to stop paying water, gas and electricity bills and taxes and to withdraw their money from state banks to exert economic pressure on the government and so force it to stop resorting to violence and meet their demands. Ebadi, awarded the Nobel Peace Prize in 2003, is one of a number of exiled critics of Iran’s leadership. Some material for this report came from RFE/RL.